The Honda HS-102V is the newest solid-state digital system available. 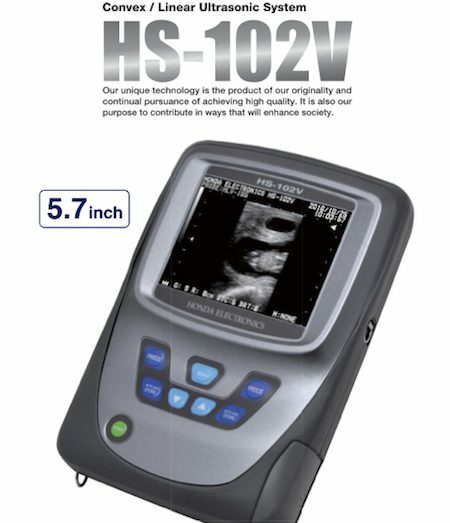 Smaller, lighter and more advanced than the 101V, this ultra-portable ultrasound scanner system weighs in at less than 4 1/2 pounds. The High Luminance LCD makes this the easiest to read ultra-portable available – visible in sunlight, with higher contrast and a wider viewing angle. With its simple button design, this device is as easy to use as it is effective. The 2-hour battery pack allows you to scan continuously anywhere, anytime. This powerful system runs Linear, Convex and Rectal probes. It offers great image quality, flash memory image storage and a USB port interface for easy downloads and transfers of files, images and data to your computer. And it's extremely affordable - all of which make it a great choice. 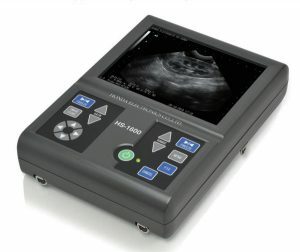 Your unique requirements for high image quality, versatility, mobility and affordability can now be met with the new portable Color Doppler system Z5Vet. With the most unique combination of high performance and low cost, the Z5Vet is the result of Mindray’s continuous efforts towards making healthcare more accessible. Be it an abdominal scan indoors, or an emergency requirement outdoors, the Z5Vet can be used for a wide variety of applications. For the first time ever, conventional cart-based Color Doppler capabilities have now been made available to you in a smart highly efficient portable design, making it possible for you to reach beyond boundaries. Z5Vet will bring you more diagnostic confidence in improving patient care across a range of clinical applications. Comprehensive Clinical Applications To improve your flexibility in different clinical applications, Z5Vet provides new designed probes which is lightweight and durable, ready to perform in any clinical situation. 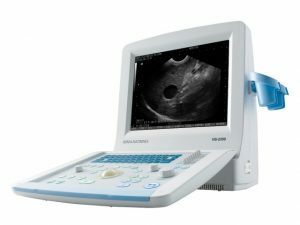 Prominent Ergonomics To carry forward the classical ergonomic design of Mindray’s Ultrasound, Z5Vet features smart new shape, compact size and light weight for enhanced mobility that allows Z5Vet to perform anywhere, any time. Please download the Mindray Z5 Vet Brochure. Innovative technology Quality exams with exceptional imaging, innovative technology and work ow e ciency, is what sets the DC-70 apart. The DC-70 incorporates an optimum balance of advanced technologies to provide quality imaging and productivity. Echo-enriched Beamformer Improved “out-of-focus” image resolution and penetration by utilizing traditional echo of adjacent beams and forming one ner and stronger imaging beam. 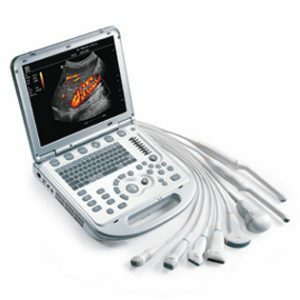 The Mindray DC-70 is a color, console ultrasound machine featuring 4D imaging and shared service configurations. Please download the DC-70 Brochure. Veterinary healthcare continues to evolve and new tools are developed to improve clinical functions and simplify processes. Our products are continually refined to ease the tasks of clinicians and increase patient throughput. The DC-8 – designed by users for users – was developed in the spirit of this commitment. 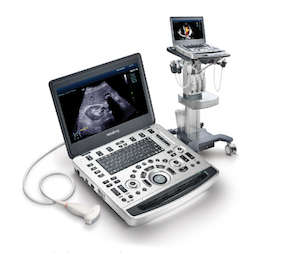 The DC-8 Ultrasound System supports the most demanding applications on a day-to-day basis. Advanced technologies, superior image quality, and a special focus on ergonomic design combine to improve patient management, increase ease of use, and enhance users’ overall level of confidence. 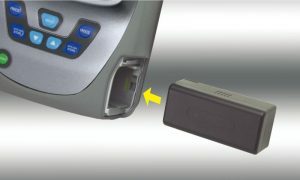 DC-8’s ergonomic solutions address every part of your body that interacts with the device. We know that users have a physical relationship with the device and with this fact in mind, we have improved procedural e ciency and reduced repetitive actions. A new user interface enables logical and e cient work ow while ensuring more convenient operation. Please download the DC-8 Brochure. The Mindray M9 next generation platform, offering robust processing power and premium imaging, affords healthcare professionals fully featured capabilities and diagnostic confidence. Fast, superior quality imaging at the point-of-care improves diagnostic efficiency. Pressing patient-care decisions can be rapidly formulated: perform a FAST exam in the emergency department, evaluate the cardiac condition of an ICU patient, or screen an immobile patient for DVT. Evaluate medical conditions at bedside more efficiently and confidently with the compact, powerful, and versatile M9 system – a new standard of point of care ultrasound. Download the M9 Advanced Brochure. Download the M9 Advanced Datasheet. Download the M9 Transducer List. 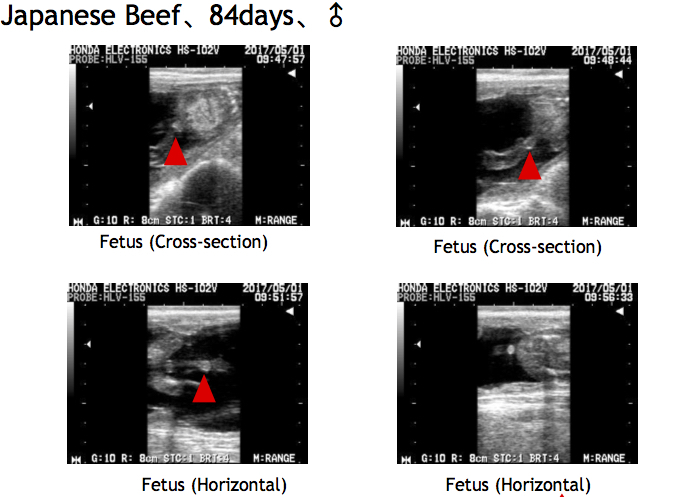 Please click below to view videos of the M9 in actual field or clinical applications. All necessary functions come in one compact unit. The compact body is easy to carry, so it is useful for clinics or hospitals, as well as for outside observation. Simple menu system is speedy for daily use. Full size keyboard with ergonomic design enables stress free operation. Smooth operation anywhere Foldaway keyboard and LCD panel make for a slim style unit that is easy to carry. System setting can be assigned to function keys up to ten setting and can be easily recalled. USB memory When a USB memory is inserted, records can be done directly into the USB memory. Moving images can also be stored to the USB memory in AVI format. Please Click to Download the HS-2200V Brochure. Please download this presentation on equine uses for various Honda Probes. 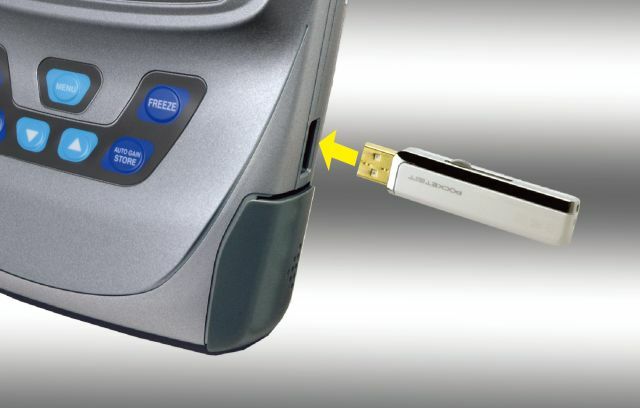 Watch video of the HS-2200V in action! The Mindray M7 Vet represents the next generation of hand-carried Color Doppler Diagnostic solutions. Combining advanced imaging technologies with cutting edge miniaturization, the laptop-style chassis of the Mindray M7 is packed with the most advanced, energy efficient and reliable veterinary medical features available. 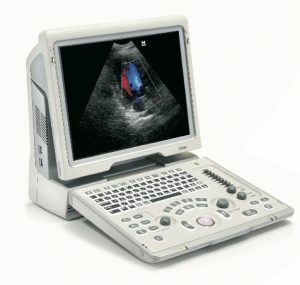 Like Mindray’s standard M7 Ultrasound machine, the Mindray M7 Vet provides outstanding detail and contrast resolution, thanks to advanced imaging technologies, including Phase Shift Tissue Harmonic imaging, iClear Adaptive Speckle Suppression, 3D imaging capabilities, and improved frame rates for color doppler imaging. 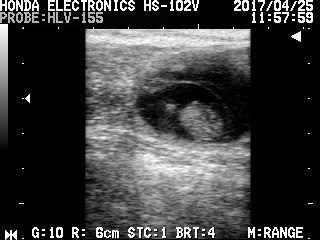 These advanced imaging techniques enable your practice to achieve unprecedented accuracy when it comes to ultrasound-guided diagnosis and treatment. The M7-Vet features fast power-up, nearly instantaneous user response, high resolution 15” monitor with 170º viewing angle, and seamless data management. The versatile transducer connectors make the Mindray M7-Vet ideal for nearly any size practice, and for nearly any size animal, whether your clients are primarily dog and cat owners, horse breeders, or owners of more exotic animals. Plus the Mindray M7 Vet is designed with your clinicians in mind, with an infection-resistant, sealed keyboard, adjustable height stand, wired or wireless data transfer, drop-tested durable chassis, and overall ergonomically correct profile. This allows the M7 Vet to be seamlessly incorporated into nearly any clinical environment. And the M7 is quality engineered in the US. 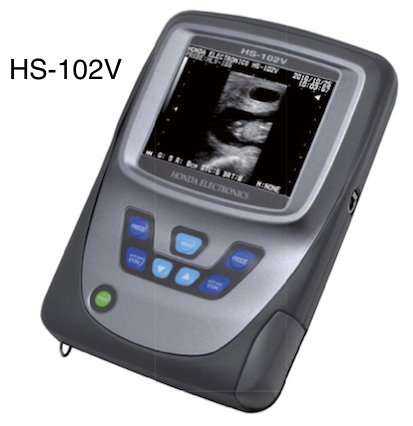 With industry-leading, on-site training to complement the M7 Vet, Products Group International is the clear choice for your investment in portable veterinary ultrasound equipment. 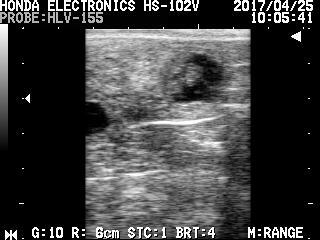 We offer repair and maintenance of your Mindray M7 ultrasound machine as well, and a full selection of veterinary ultrasound accessories, including biopsy needles, stands and cases, transmission gel, used machines and more. 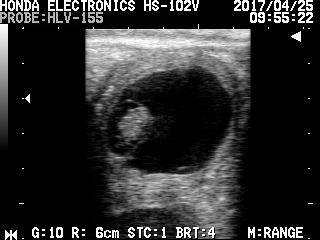 Our veterinary ultrasound specialists are ready to assist you in putting the Mindray M7 to work for you. Call us for pricing at (800) 336-5299 toll free US/Canada (303) 823-6330 office direct/Int'l, or use our contact form for for a quote. 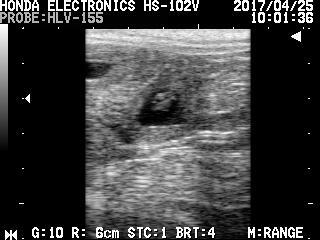 Our unique veterinary ultrasound technology is the product of our originality and continual pursuance of achieving high quality. It is also our purpose to contribute in ways that will enhance society. 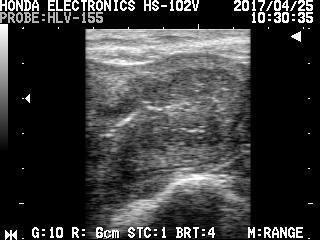 Mobile body with highest quality of ultrasound diagnostic that represents scanning region in detail. Advanced image enhancement technology, "H-res", provides the perfect solution for visibility. 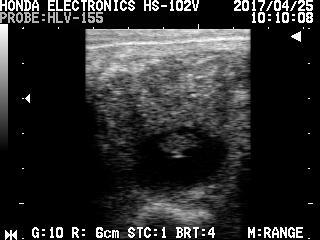 Probe Selection Broad diagnostic applications with clear veterinary ultrasound images made possible through the wide range of transducer selections. Both Battery and AC Power Usable Integrated high performance lithium ion battery in the body realizes 3 hours use in without an external power supply. Battery reporting features provide signals to inform the user of the remaining battery time. Measurement Functions Measurement is prepared for small, large, and mix veterinary practice animals. Scanning images and measurement results can be stored under in the database easily. Preset Registry Favorite presets can be registered and recalled, simply and easily. Shoulder Belt Both hands are freely usable when the system is held in place by the shoulder belt. This also happens reduce physical strain for the user during long operation times. Watch video of the HS-1600V in action.